Whether your creative vision is functional or fanciful, bring it to the intersection of industrial technique and visual artistry. 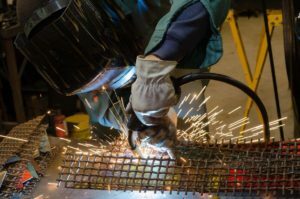 In this workshop you’ll find the inspiration, raw materials, tools, and practical instruction and guidance that will empower you to build in metal the forms you imagine. Expect a fully hands-on experience of creation. From your instructor’s “scrapyard palette,” you’ll pick and choose finished and unfinished metal pieces to shape into your one-of-a-kind finished work. You’ll learn how the welding process not only fuses and cuts metal, but also imbues distinctive colors. And with a complete array of tools at hand, you can throw open the doors of artistic possibility and take your ideas as far as you can. Techniques you’ll learn include MIG welding, spot welding, oxy-fuel cutting, hammering, bending and cold sawing. While experimentation and collaboration will be encouraged, the core objective of this weekend course is to enable participants to confidently construct sculptural metal objects using basic techniques. Student work has ranged from ornamental sculpture to furniture and lighting fixtures.